This book brings together over 40 papers presented at the 1992 International Construction Conflict Management & Resolution Conference held in Manchester, UK. Six themes are covered, including alternative dispute resolution, conflict management, claims procedures, litigation and arbitration, international construction, and education and the future. 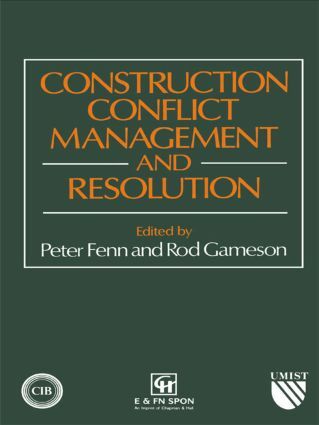 With papers from arbitrators, architects, barristers, civil engineers, chartered surveyors and solicitors, this book represents the first multi-disciplinary body of knowledge on Construction Conflict and will act as a unique source of reference for both legal and construction professionals. Introduction. 1. Alternative dispute resolution. 2. Conflict management. 3. Claims procedures. 4. Litigation and arbitration. 5. International construction. 6. Education and the future. Index.